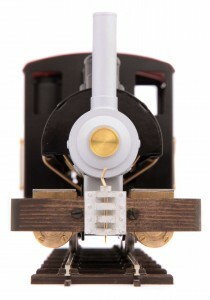 Sammie is the second of our ‘Basic Series’ locomotives. Though freelance in design, he is styled after the many small to medium sized saddle tank locomotives from such builders as Baldwin and Porter . Personalize it to your own requirements with the additional parts and accessories available. 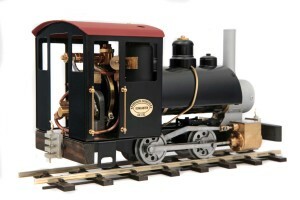 0-4-0 inside framed chassis with double acting slide valve cylinders operated by slip eccentric valve gear. Internal gas firing using the ROUNDHOUSE ‘FG’ gas system. Controls fitted as standard are:- steam regulator, safety valve, displacement lubricator and gas regulator. Dimensions (loading gauge) are:- length 265mm over buffers, width 118mm, height 145mm, weight 2.1Kg. 32mm or 45mm gauge (non adjustable) please state when ordering. *NOTE* Insulated wheels are not available on this model and a gas filling adaptor is required..